What are Content? Pictures, Text, Video??? While these are all types of content they really don’t layout the exact formula you should use to convert your visitors to customers. 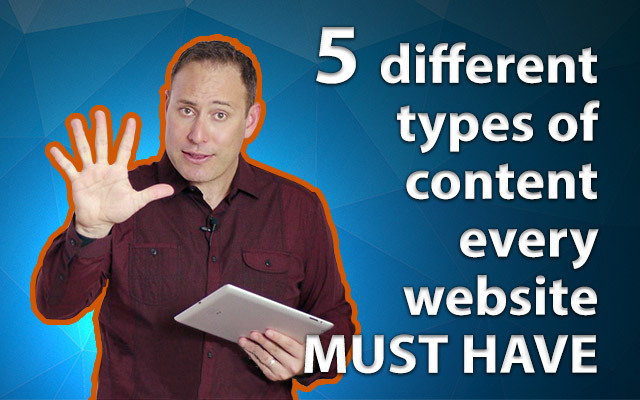 Hey David Judge here and in today’s short video I’m going to talk with you about the 5 different types of content every website must have. Before we jump in I want to give a heads up to Hanna Smith who works with the content strategy team for distilled which is where I gathered some of my intel. When talking CONTENT we’re approaching todays video from a strategy perspective and how you can get a better understanding of how you can set up your website. We’re basically discussing the different content for the different pages on your website and how the use of video, text, audio, graphics, etc, can come together to create an awesome website. So, lets start with a Question? What is the purpose of your website? When I ask that I mean the FINAL Goal? Is it for you to offer FREE advice? To get people to visit? To have people call you and tell you how good you are? While all of these are great (especially if people are calling you to tell you how awesome you are) at the end of the day in business your website is designed to bring you the folding green (you know, money). Imagine you’re meeting a person for the first time, lets say at a networking event. If you’re going to do business with them you need to go through certain steps. If you meet a person for the first time and as you’re shaking hands you ask them for the sale then the chances of you closing are going to be smaller than ZIP. This makes sense as you need to develop a relationship and gain a persons trust before they choose to do business with you. This is exactly the same when it comes to your website and the 5 different types of content you should create to emulate those steps (of developing a relationship with a person) all with the end goal of getting them to part with their cash. Last point before we get into the sharing… as we go through I want you to think about your own website and which pages of your website fall into what area and if those pages are set up the best ways to get the best results. This is content that creates an emotion when people see it. It can be funny, cute, controversial, cause people to feel empathy all with the main objective of causing an emotion. The purpose of this type of content is to help your site to stand out from every other site and to encourage people to share and/or interact with your information. As an example, I can see a case study that really draws on the pain and success of a story falling within this category. This is delving into the how’s, what’s, where’s, when’s and why’s of your business and is really to educate people around your industry and to also show others you are an authority in your subject. Think of this like a parting of your knowledge broken into smaller manageable chunks where you educate on the different elements of your business from your perspective. You can also educate around the best way to approach your type of business and even share subjects that others outside of your industry may not be aware of. Content that shares empirical facts or delves deeper on your ‘content to educate’. This is where you can really expand on a specific subject and the small facets that make up the overall content. The purpose of this content is to show people you understand what you are talking about which will in turn, position yourself as an authority. An example could be the subject of Ants. Educational content could discuss the different types of Ants based on where you are in the world, mentioning that black ants are very fond of sweets. Supporting content would delve deeper into the idea of ants and sweets, explaining why this is the case with supporting facts and data. As it sounds, ‘supporting content’ acts as a support to your ‘educational content’. This is content that shares the benefits in taking the next step when dealing with your business. This is emotion driven where people feel what it would be like to do business with. As I just mentioned this should be benefit driven, meaning a person can place themselves in a state of WIIFM. An example could be to discuss the top 10 benefits in using your product or service and whilst this may contain elements of education it really should secure an emotional connection between your business and potential customers. All of your content should be designed to make sales, even if it’s educational, entertaining, etc and lead visitors down a funnel of dealing with you. On your website you do this by your calls to action, contact forms, telephone number and plainly telling a person what they need to do next! This is like a factual way of telling people how to buy your stuff. One last point, this content should be easily accessible at all times and make it easy for a person to know how take the next step. Ok, that’s our 5 and I want to you leave with a little action step you can use to rate your own website. So, take a look at the different pages of your website. Do you have content that covers each type and can you easily classify each page? For example, are you using a blog to entertain and educate or are you using it to sell. In fact, are any of your pages there to generate leads by drawing on benefits and emotion and is your content to make sales easy to find and factual? By applying this 5 type formula you can understand from the very beginning the purpose of the content you will create and how it will fit on your overall website. Ok, great, lets wrap up and in the next video we’re going to talk about The idea of Paid Vs Organic traffic (Adwords or SEO). We’re going to explain how you can determine which one is the best fit for your business and what to expect from each strategy!